Welcome to The Blackdown Hills Hedge Association. Next season's hedgelaying course dates and booking now available. A very successful "Skills of the Hills" event complete for another year. We will be at Stockland Fair (sitting down, mainly). Demonstrating (something) at the Green Scythe Fair. 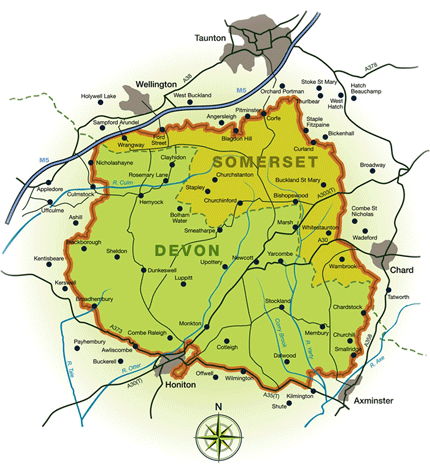 We will be at the Honiton Show. First BHHA hedgelaying course of the new season. 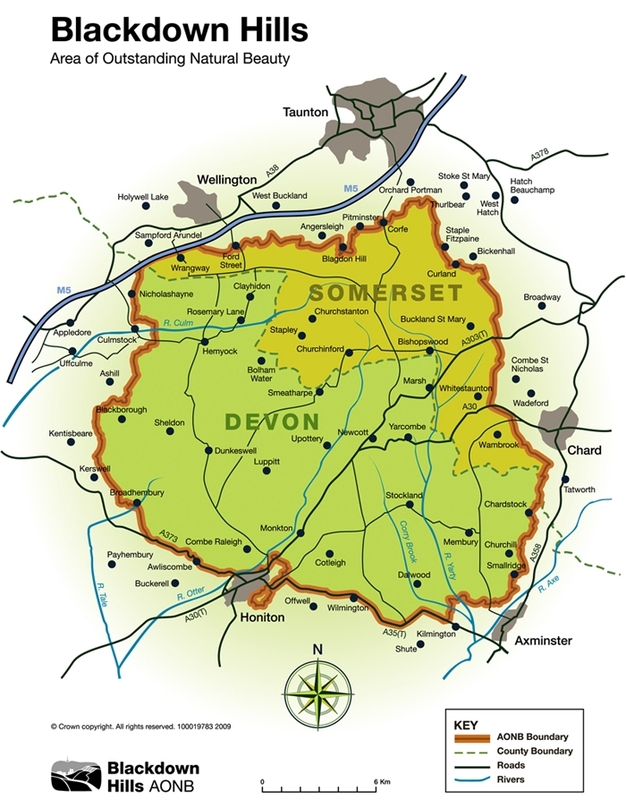 The Association comprises an enthusiastic group of people working and living on the Blackdown Hills who are dedicated to preserving the craft of hedgelaying and other related skills in the Blackdown Hills Area of Outstanding Natural Beauty. The aim of the Association is to do their utmost to preserve the rural skills associated with hedgerows. 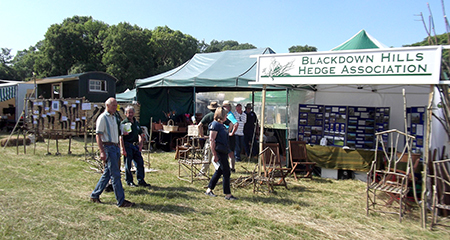 We run training courses in hedgelaying and hedgerow crafts, attending local fairs and agricultural shows with a stand and demonstrations, and staging the "Skills of the Hills" annual event. 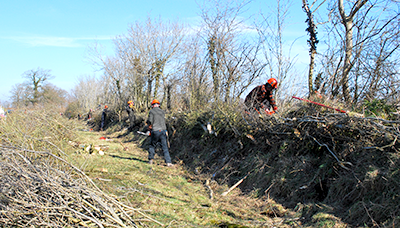 The members of the BHHA regularly take part in hedgelaying competitions both in the South West and nationally. One of our main activities during the winter season is running courses teaching the Devon style of hedgelaying. The BHHA course is rightly celebrated as being one of the most "hands-on" courses you can go on with one experienced tutor to each pair of students laying their own section of hedge. 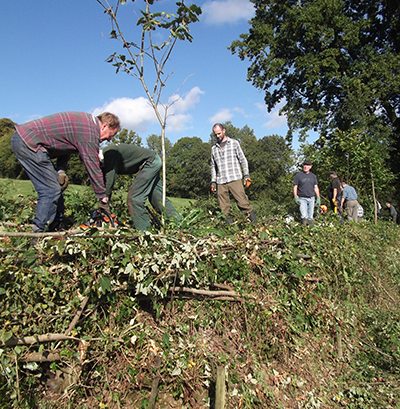 For more details and a schedule of next season's courses see the hedgelaying course pages. Our craft courses and workshops are aimed at promoting and educating people about rural skills and crafts using materials from the hedgerow. 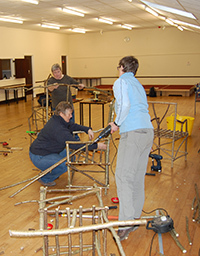 We have courses on making hedgerow chairs, hazel hurdles, and various types of traditional baskets. More information and course dates are on the craft courses page. The highlight of our year. It is the largest regional hedgelaying competition in the country and the second largest overall. (only the National Championships are bigger). With craft demonstrations, entertainment, and hot food & drink it is a day out for the whole family. The latest event page has the results of the most recent competition and a gallery of photographs taken on the day.